Includes red leather scabbard with brass ornate pierced work throat and tip. Includes black scabbard with brass throat and tip. The Korsoygaden Viking Sword is an ornate replica based upon sword was found in a stone "cist" in 1888 while railway work was being conducted on farmland at Korsoygarden in the Hedmark district of Norway. The hilt represents a late surviving transitional Viking form. Our version features a hand-forged steel blade, a black leather grip with brass guard and pommel. Overall length is 40.5". Includes black scabbard with brass throat and tip. The Saxon Sword has a indented wooden grip with an inscribed brass pommel and guard. The fullered blade is made of EN45 carbon steel and 30" in length, and overall 41". We also include a black scabbard with brass throat and tip. This Viking sword is made out of 18-gauge EN45 steel, approx. 40" in length, brass guard and pommel with etched detailing.Includes red leather ornate scabbard with brass throat and tip. This sword features a hand-forged steel blade with fullered blade. 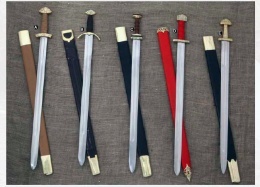 The brass guard, hilt, and pommel are etched in period design. Includes black scabbard with brass throat and tip. A.Viking Sword “Odin”: Viking swords displayed at the Wikingermuseum in Hedeby. This page was last modified on 14 June 2014, at 09:52.